Businesses with premises located in New South Wales can take advantage of a competitive energy market where retailers set their own electricity price tariffs and offer usage discounts for switching. This is due to state energy deregulation from 2014. Read more about energy market deregulation in NSW. Make it Cheaper compare a panel of multiple retailers for business and residential customers in New South Wales, including AGL, Origin and Energy Australia. View more information about our retailer panel. Finding a cheaper electricity deal, rates and prices for your business can be a complex and time consuming process as you need to properly understand the different ways retailers price their offers, and how these relate to your business' electricity consumption patterns. Make It Cheaper is a business electricity broker and comparison service with the goal of saving time and money for small to medium businesses in NSW. We compare up to 10 energy suppliers in our panel and will help you identify and switch to a cheaper offer. Our service is completely free and we've saved Australian households and businesses over $40 million since 2009. As part of our savings guarantee, we only recommend switching out of your existing plan if we can find you savings from our comparison panel. Will I be penalised for switching energy providers? No. Due to changes that came into effect on 1 January 2018, all energy retailers are prevented from charging early contract termination fees for all NSW residential and business electricity customers. Learn More. NSW businesses are able to freely switch to cheaper electricity providers at any time without penalty. 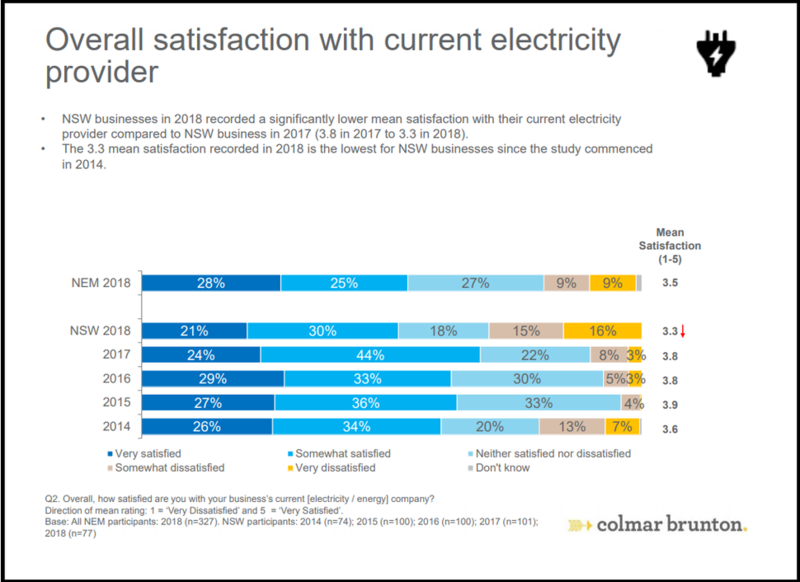 According to a report commissioned by the AEMC, only 21% of small business respondents reported to be 'very satisfied' with their current electricity provider, although this was a slight improvement from the previous result in 2017. 30% of small businesses reported they were 'somewhat satisfied', 18% were neither satisfied nor dissatisfied, 15% were somewhat dissatisfied and 16% were very dissatisfied.